Pete Carroll says Seahawks have fielded, and spurned, trade offers for Richard Sherman. Burt after last season’s strife, matters need fixing, because Carroll needs to draw a line, even with Sherman. In light of Pete Carroll’s remarks Tuesday in Phoenix at the annual NFL owners meetings, it’s fair to wonder if the Seahawks coach is ready to move on from CB Richard Sherman. While he denied any trade is in the works, he didn’t exactly slam the door off its hinges regarding the rumors that surfaced the past week. “There have been some teams that have called, and so we’ve talked about it,” Carroll told rep0rters at a scheduled media breakfast. “But he’s extremely important to our football team. All of that sounds reasonable. Except that Sherman is one of the Seahawks’ core guys. Even the idea of trading Sherman, who at 28 is still at or near the top of his game, should have elicited from Carroll a guffaw measured by that Saffir-Simpson scale used for hurricane strength (“Hurricane Peter is a cat-4 gaining strength over the western Carribbean”). Instead Carroll was merely a tropical zephyr. The reason people are interested enough to call is that they saw Sherman go off the rails for awhile in Seattle, which doesn’t often happen at the Hogwarts of the NFL. If any of those callers hold a top-10 draft pick, one where the Seahawks may believe lurks a Sherman-level talent to refresh a somewhat tattered secondary, the teams want to know in March what the Seahawks’ parameters are when April 27 rolls around. At issue, of course, are the two sideline episodes last season when Sherman publicly and overtly berated coaches over their decision-making. The first time in October was against Atlanta, when Sherman castigated defensive coordinator Kris Richard for a miscommunication that led to a touchdown pass. In December, Sherman jumped Carroll and offensive coordinator Darrell Bevell over choosing to pass from the one-yard line, even invoking the Game That Shall Not be Spoken. Since Sherman violated the custom about not speaking harshly to the side of the ball not his own — and especially since the Seahawks passed two plays later for a TD — I asked Carroll the next day whether what Sherman did amounted to insubordination. Somewhat surprisingly, he offered a qualified yes. “I think if we weren’t able to come back from that, I think so,” he said. “It would depend on how the meeting went. The meeting went very well and it was very clear. Apart from Carroll talking in circles (fine . . . but not OK), it was plain that Sherman had to talk back his actions, presumably to avoid some sort of sanction. No one explained how that worked, or what punishment may have emerged, although Sherman lost no playing time. But when Sherman next spoke to media, he expressed no contrition. Certainly, it was not required, but it seemed as if it would have been a strategic thing to help put matters to rest. Sherman’s impulse toward confrontation certainly was borne out a few minutes later when he left the podium, issuing a threatening retort to a question he didn’t like from ESPN 710’s Jim Moore. After the incident went national, Sherman later apologized via Twitter, but his words seemed insincere. The reason for the rehash now is not to castigate Sherman but to explain that insubordination on a sports team is a corrosive thing that, left to fester, can cost a coach a lot in the locker room. That’s partly why Carroll in 2014, despite the inevitable controversy and lost value, ridded himself of WR Percy Harvin in an abrupt trade to the New York Jets: Yes, Harvin twice fought with teammates, but he also refused to re-enter a game when the coach demanded it. Can’t have that in team sports. But Carroll Wednesday remained supportive of Sherman, publicly at least. Really, he had no choice, going to lengths to explain and defend. “Richard went through a lot last year, most of it self-inflicted,” he said. “He got out there and he was in the midst of a season that was really challenging for him. If you remember when he did have his issue, it was right in the midst of playing some great players week after week after week. He was teed up for it. And he was competing like crazy. “The only thing that happened is he just didn’t come back to us. He didn’t reset as he has. He’s always found his way to reset. He kind of stayed on the edge throughout the season, which was very challenging for him to carry. He’s a very capable guy at dealing with all of the issues that the league brings and offers for guys. And he’s a guy that’s always going to be out in front. That’s where he should be. Carroll’s remark about “not coming back to us” was illuminating. It’s apparent that in Carroll’s view, matters at season’s end were left unsettled, presumably after the exit interview. The remark didn’t mean Sherman was being traded, but suggested he had temporarily lost the buy-in Carroll covets from his leaders. During an interview on ESPN’s “First Take” this week, Sherman seemed to confirm the supposition. It appears Sherman and Carroll have work to do before the draft. If they can’t get it done, don’t be shocked if there is a trade. Disagreements are part of a championship pro sports operation. Insubordination cannot be any part of a championship pro sports organization. 28 years old, makes a huge amount of money, appears to have lost a half step. It would be very Belichekian to deal him now if the price was right. Plenty of corners in this draft! Belichekian is a good analogy. I can see where a trade would be tempting for the Hawks on several levels,but that would leave both corners unsettled going into camp, and no one knows if Thomas will be ready for the start of the season, it’s already been concluded that Shead won’t. Chancellor may not want to go on past this or one more season. Looks like the overhaul may be already underway . . .
Keep in mind we don’t know the return on Sherman. I speculated on a high first-round pick because the CBs in this draft group are outstanding. But it needs to be more than that. although they would purge $11.4M under the cap too. Sherman for Butler and a 4th (or 5th) rounder? To the Pats?! Turn in your 12 jersey and face paint. Funny! Just thinking that Butler is younger, makes less (for now), still improving, and a quiet team player. I’m willing to deal with the Devil…plus, I would love to hear Sherman ask Brady each day, “You mad, bro?” in practice. Bill would have no problem making a move. But Sherman and Earl Thomas are keys to everything done by the Seahawks. Pete will go to great lengths to make this work. Regarding Richard: What would PC do has been the question for sometime now. It appears Richard is on notice. Richard plays with passion, skill and courage. He needs to keep himself within the boundaries of team conduct and team goals. Doesn’t seem like it’s asking a lot, does it? I enjoy watching football. If I want to see a freak show, I can find an outlaw carnival. The same goes for watching dysfunctional, stare down, jailhouse brawls. Go to jail to watch the action. It is time to make the move. Any move. Keep the team fresh and enjoyable to watch. I don’t have any plans for this weekend. Where is the “outlaw carnival” at? Do they have cotton candy? The formal ones were killed with political correctness. I’m on my way downtown Olympia for lunch. It’s the same. Cheer us up with a report from the Legislature. Just rumors today. The Legislature may be pushing Gov. Inslee to appoint a sports czar to end Seattle’s arena dithering. Someone with Mayor Murray’s ear. The name Michael Shiosake with a $500 k annual salary is the forerunner to make the Key Arena red herring go away. Gov. Inslee may be receptive if Hansen will use carbon fiber mesh in the cement. Not sure I’ve seen a freak show going on, nor have the Seahawks approached anything like what we’ve seen on other teams in Seattle and elsewhere. With high-maintenance, superior athletes, it is never easy. Sherman’s actions and comments over the past 9 months indicate that he thinks he’s bigger than the team. I hope he can get his hat size under control, but if not he needs to go. An inability to admit one’s own mistakes corrodes leadership. There are immediate analogies elsewhere in the culture too. Well said, though I would miss him, though he has the ability to piss off a circus clown on occasion . . . I don’t see the Seahawks winning another championship without Sherman. The real question is whether the decision-makers believe they can win one with him. Reading between the lines, the answer for Carroll is “no” unless Sherman can get himself “reset”, which is a simple word for “playing with intensity without undermining the whole program”. A good assessment. The bosses haven’t lost sight of Sherman’s field value, but they are bothered by, as Carroll called, “self-inflicted” damage that hurts his production and that of the team. In the Atlanta game, it took most of the second half before he put the tantrum behind him. Please, Sherm, come back! You used to be one of my favorite players. You still can be. Whatever crazy headspace you need to get in to be such an awesome player, go for it. I love it! But when you go there, please figure out a way to distinguish between opponent, teammate, and, especially, coach. Or how about just letting them know that, hey, you’re sorry. It’s really not the least bit complicated. Saying sorry can be very difficult for some successful people. 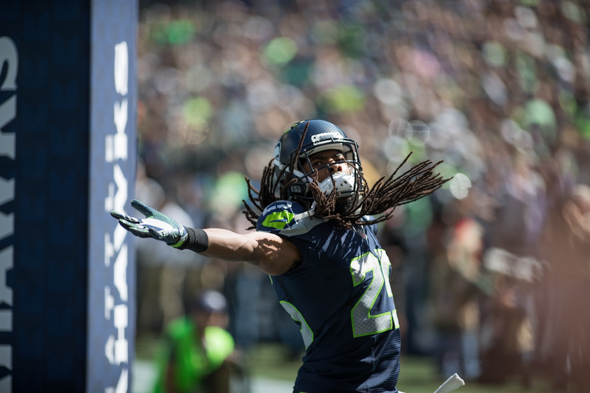 Sherm has gone a long way being Sherm, but he has to know there are limits in a team sport. Otherwise, go play golf/tennis and be John Daly/John McEnroe. This Richard Sherman stew is serious business. All the kids are talking about it down to the CornDog Hut. (right behind the Outlaw Carnival). Robin & Maynard! Cool if it’s you! Robin, are those your kids you’re talking about? No, it isn’t Robin. I believe it’s Roy Otis, hacking the account. The giveaway was CornDog Hut. Roy is the IT manager there. The off-season drama is heating up here. And, Art is bringing it like no one else here can. The core group signed to deliver SB shows is still intact. Probably on it’s end run this year. The OL finally looks to be heading forward. BUT, Sherman, the self described cog in the defensive wheel to do this thing has become sort of a problem. And, there are CB’s out there in the draft this year. I’d say, Pete and John are singing “Great Balls Of Fire” right now. Sherman has doused the piano with lighter fluid because he thinks he’s like Jerry Lee Lewis, better than the late Chuck Berry. So, does Pete throw a match on it and tell Sherman to exit stage left? If they get the right trade giving them the draft pick for the next CB Richard Sherman wanna be, that is if he’s really out there, that piano goes up in flames. I like the analogies, but the kids are scrambling to figure out the Jerry Lee reference. Remember kids: If he shows up to your door asking to see your sister, slam and lock the door. Good summary. Sherman did not cover himself in team-centered glory last year. This article is even missing something pretty significant, in my view–Sherman in a recent interview denied saying to the reporter what microphones verified he did say. And what he said was not subject to more than one reasonable interpretation, despite what Sherman nevertheless tried to imply in that interview. That denial bugged me at least as much as the rest of it. It shows either a self-delusion or a dishonesty that don’t fit on any team. If it’s really about winning, and not about him, he won’t do it again. You’re right, Bruce. I should have included it, because the episode seemed nearly delusional. I was at VMAC for that presser and watched it play out. For Sherman to say no one knew what was said was, well, alternate facts. It was so out of character for a guy who understood media’s role in helping him advance his aspirations, football and otherwise. Teammates who know him better than me I believe are puzzled too. They all know he is as smart as he is stubborn, but this turn of events was, as Carroll said, self-inflicted. He played hurt half the season. Did his injuries play into this? Pete is trying to cut him slack for that, but in doing so nearly put the Seahawks back in NFL jail for twerking the injury report. Twerking? Nobody wants to see Pete do that. Nobody. Sherman all on his own (one player) locks down 1/4 of the field. That’s huge and allows the other 10 defensive players to focus on the rest of the field; same is true about Kam, and Thomas. Now on offense, Marshawn forced defenses to commit a minimum of 2 players (and often 3) just to defend against Marshawn even with the Hawks crap O-line. Marshawn is gone and defenses now commit players to trashing the Hawks O-line. Offensive play call has not adapted to Marshawn being gone; and neither has the O-line coaching nor O-line recruiting adapted. Blame the coaching folks. If the offense doesn’t put up points and the Hawks defense spends over ¾ of the game on the field (which happened one game), we lose. Lynch did almost nothing in his final season, and Rawls lead the league in rushing for the games he played in. The Seahawks need to run the ball for their offense to work, but it doesn’t have to be Lynch. Pretty much. John. The team is built from the back of the defense, which is ordered to take away the deep threat. Once the D makes the foe mostly one-dimensional, the ground-oriented offense keeps the ball, avoids turnovers, and owns the game. That why trading Sherman after a serious injury to Thomas would be a hard thing to justify unless the return was outstanding. I realize, before I even say this, that I’m probably being completely delusional. A team cannot allow any one player or players to undermine “the program” with insubordinate behavior. If (just for the sake of discussion) the Seahawks were to trade Richard Sherman, I would hope it would not be for less than two *VERY* high draft picks (perhaps two #1s). And you can’t trade him to the Patriots (although the Patriots are reportedly interested), because that would be like a liquor-store clerk handing his/her gun to the would-be robber. I would only (honestly) be “happy” if the Seahawks could obtain Sidney Jones and Kevin King in exchange for Sherman. (And, “Yes,” I do realize that King is much more the prototypical Seahawks’ CB in the Coach Carroll era.) I honestly hope that Richard Sherman is going nowhere, but if he and Coach Carroll cannot “get to ‘Yes’,” I think he’d have to go to a team such as the Browns, 49ers, Bears or Jaguars . . . wherein it would give Seattle access to almost any player in the 1st Round. The only delusion is this saga is Sherman’s denial that the Jim Moore episode happened (see answer below). The Seahawks are holding out hope that Sherman comes back to the ranch before the draft, but I don’t think Carroll wants to put up with a lack of team commitment over side issues. Bad precedent. It was enough of a struggle with Lynch. He plays the second toughest position in football, and plays it well. He is not a great player anymore (if he ever was), but he is solid and there is no one to replace him should he be traded. So, they will have to live with him. His persona is detrimental to the team, and he does not understand that. It’s Carroll’s job to TRY and make him understand that.